Oil cooled motor for 4" pumps in AISI 304 stainless steel with cable and connector.Franklin motor version water water. NEMA standards coupling. Motor sleeve and upper cover in stainless steel AISI304. O-ring in NBR. Membrane of compensation in rubber. Franklin Motor: Exterior sleevet in stainless steel AISI316. Two poles motor with permanent capacitor (not included). Control panel for submersible pumps with overloads and dry running control without probes. Maximum intensity 12A. Manual / stop / automatic operation switch. Multi-function control panel for bore hole pumps with large screen for parameter display. Variable frequency drive that can be used in any type of pump equipped with an AC motor, directly from the photovoltaic panels. Compact 4 "submersible pumps with 2-pole motor, single-phase motor with integrated thermal protection. Compact 5" submersible pumps with 2-pole motor, single-phase motor with integrated thermal protection and float switch. 3" centrifugal submersible pumps with a wide range of flow rates and lifting heights, with reliable and robust oil bath motors, fitted with a check valve. 4 "centrifugal submersible pumps with a wide range of flow rates and lifting heights, with reliable and robust oil cooled motors. Motor coupling according to NEMA standards. Kit consisting of: 3" centrifugal submersible pump with oil cooled motor, electric cable (Length according to installation characteristics), and control panel. Kit consisting of: 4" centrifugal submersible pump with oil cooled motor, electric cable (length according to installation characteristics), and control panel. 6" submersible wet end with st. st. impellers with anti-wear elements in stainless steel, coupling according to NEMA standards. 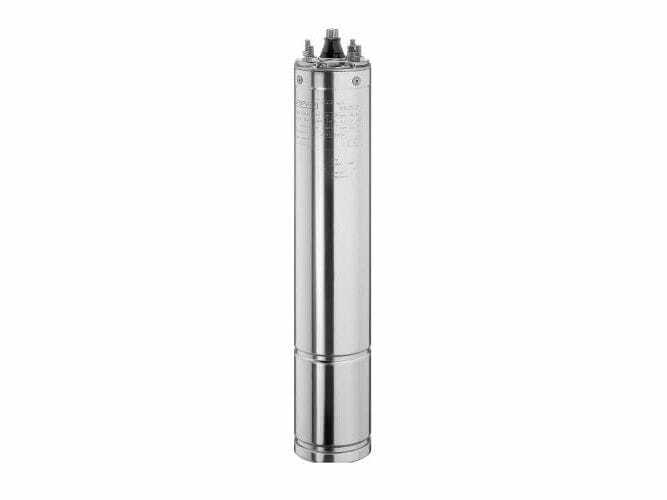 Submersible pwet end of 8" with high hydraulic performance totally in stainless steel AISI 304. Coupling according to NEMA standards. Multistage centrifugal pump manufactured 100% in stainless steel AISI 304 with water cooled motor built-in frequency inverter.